I had another picture taken for today's Project 365 selection - a fairly mundane one of the boys playing the Wii. (One of the concepts around Project 365 is to capture the "every day" aspects of your life - kids playing video games certainly fits that concept). The stool is in the kitchen because the kids have taken a liking to it and its functionality - it allows them to sit and eat at the kitchen island. 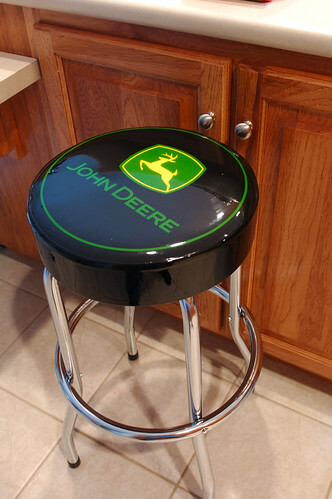 So until I go out and purchase some more appropriate stools (I'm thinking two), the vinyl-chrome-clearly-doesn't-match-the-rest-of-the-house decor stool is going to stay in the kitchen. Yee-Ha!